For four years the Pine Mountain Trail System was used for a series of events known as the North Face Endurance Challenge. 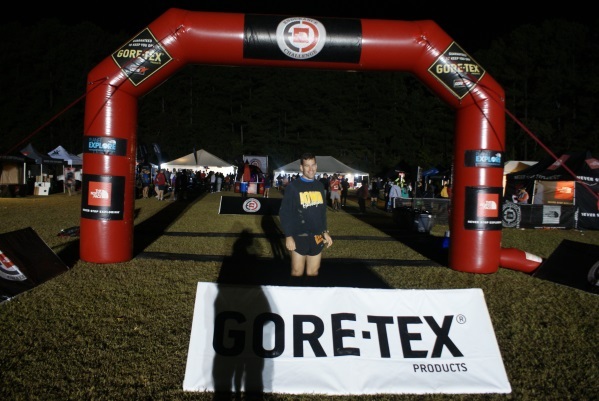 The events on our trail were the only events The North Face did in the Southeast. The Challenge director Nick Moore, contacted Jim Hall of the PMTA and the FDR State Park assistant Manager Clint Rouse about using the PMT and FDR State Park for the events. With great assurance the events would be well staffed and run the Ga DNR agreed to the event. It turned out to be a win-win situation as hundreds of runners, their friends and such showed up for the events. Northface asked for help in manning “aid stations” along the course route at road crossing and the PMTA manned one at Rocky Point Parking Lot for four years, and one at BootTop Trail Parking Area for two and another. The events main run was a 50 miler, a 50K and a marathon followed up on Sunday with shorter races and activities for children. Northface set up an electronic start point in the field across from the Liberty Bell Pool. Due to marketing plans and desire for more participants, The North Face did not return the event to FDR State Park and the Pine Mountain Trail in 2014. At present time there are no plans for The North Face to hold the event again at FDR. . For more information about future Endurance Challenge events elsewhere, see The North Face's web site. By the way, the winning time on the 2013 50-mile run was 7 hours and 42 minutes, just shy of 8 hours for 50 Miles. Do the math on that one and you'll see the winner was running about 6.45 miles an hour! In 2011 PMTA volunteers worked right up to that weekend of the event doing some final dressing up work along the trails and making sure all blowdowns were cleared which as many know was post April 2011 tornado related. . Thanks to so many who worked hard in the areas of mile 12-13, around mile 14, mile 15, the Beaver Pond Trail area, and over to mile 22.5. Folks like Ed Jones, Bill Storey, Joe Skinner, Jack Combs, Jonathan Hall, Jim Hall, Eddie Hall, Carl Carlson, Larry Day, and Ronnie Heard and his guys put in some extra time on the sections mentioned (in addition to the work days that Carl Carlson led). On September 28th at 5:00 a.m., the 2013 The North Face Endurance Challenge 50-mile event runners left the starting point down across from the Liberty Bell Pool. Shortly after that, PMTA volunteers again gathered at Rocky Point Parking Lot and set up an aid station for runners. 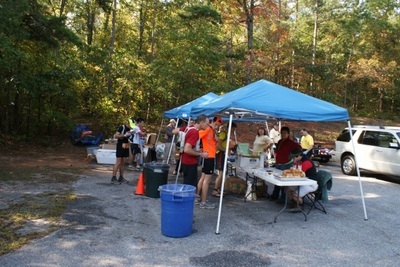 At nearly the same time, another crew led by Jim Halling set up an aid station at the new Boot Top Trail parking area. With a generator providing lights, we set up tents and tables and set out food and signs before the first runner arrived just after 8 a.m. Rocky Point Aid Station had 50-mile runners, 50-K runners, and Marathon runners come by. 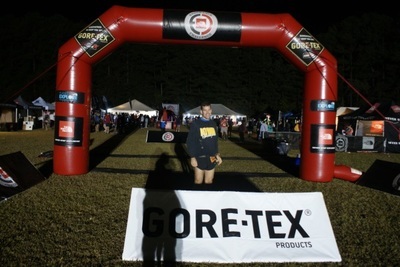 The Georgia DNR parks division had two medical people on hand at Rocky Point, and they treated many runners for scrapes, cuts, sprains, and other running-related injuries. 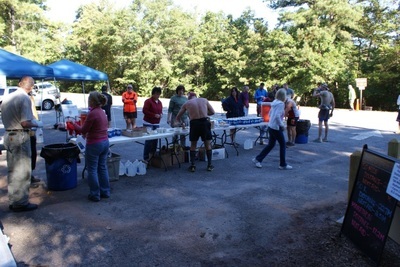 There were aid stations at all the other named PMT parking areas and down near the trail's start on GA Hwy 190. These were manned by other volunteer groups. There was a new aid station over near the Good Shepard Riding Academy and PMTA members Gene & Christy Wells helped with that one. Several folks like Carl, Danny Rumney and Patty Gilliland worked at the main event area down near the Liberty Bell Pool. 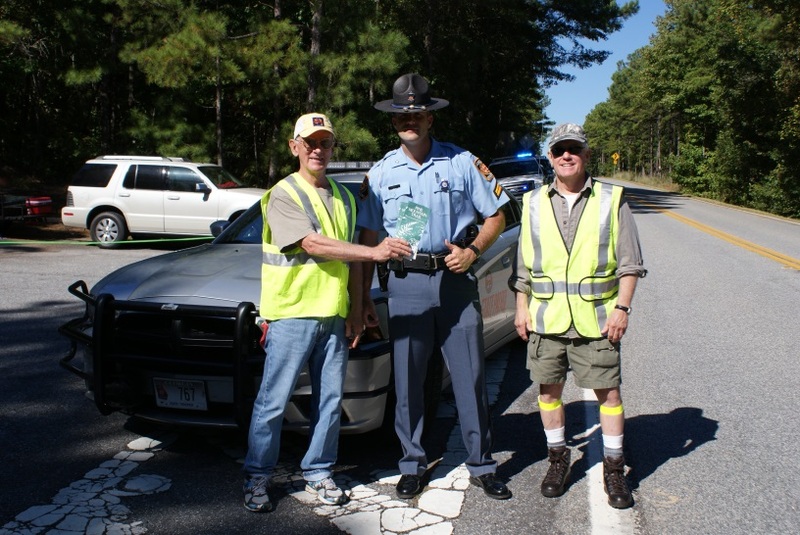 Thanks also to the Georgia State Patrol for having two units patrolling GA Hwy 190 during the peak hours of runners crossing the roads for two years. Overall, The North Face had four great event using our trails at FDR State Park. The Pine Mountain Trail and FDR State Park saw a lot of new faces viewing and participating in The North Face events. 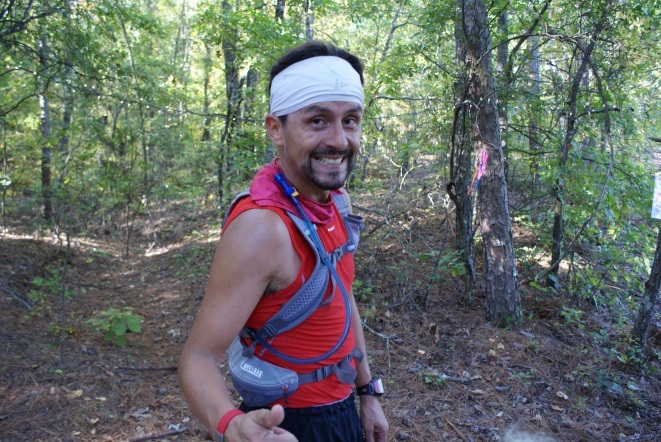 These events really opened up interest locally for both hikers and MANY runners.